The transformation of ornamental hibiscus from obscure species to its present high state of cultivation is due to the work of amateur hybridizers rather than formal genetic research by plant scientists. It is to these men and women, creating beauty in their own gardens the world over, that this book is humbly dedicated. 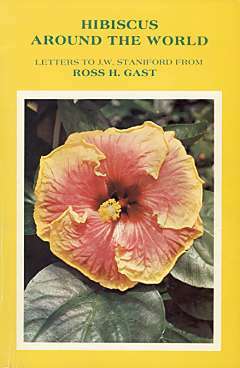 "HIBISCUS AROUND THE WORLD" is an informative account of Ross H. Gast's four year search for new species and old forms of ornamental hibiscus for use in the development of hardy cultivars for Southern California conditions, the objective of his hibiscus improvement program sponsored by the Los Angeles State & County Arboretum. Presented in the form of letters to Joseph Staniford, his collaborator at L.A.S.C.A., written during his world-wide travels, Gast also includes a detailed, entertaining account of the social, economic and historical background of the areas visited. Written in 1963-67, the letters have been updated with footnotes, adding greatly to their reference value. As this little volume is a series of communications between two friends deeply involved in the improvement of ornamental hibiscus, it seems quite appropriate that the usual introduction found on the lead pages of most books be presented in the form of a letter to the reader. After all, anyone interested in ornamental hibiscus is a friend of the writer and, therefore, a joint addressee of the letters reproduced herein. champions to her credit. Obviously, her service as "Madame Secretary" of the world-wide search for new hibiscus species meant that she had to give up, for the time at least, her own hobby. Several years ago the writer Xeroxed several copies of "Letters to Joe", written on the first "expedition," and bound them in booklet form. A copy was sent to the American Hibiscus Society for its "Archives". Sue read this and insisted they be published, together with letters on the second and third "expeditions". The history of the writer's love affair with hibiscus is made clear in the letters which follow, but Joe Staniford's place in the hobby, although substantial, has not been told. hybridization of hibiscus in Florida by members of the American Hibiscus Society. My name was mentioned as being one of the founders of that organization in 1950 and an active member of the group participating in improving ornamental hibiscus. Surprised to learn that another "afficionado" lived close by, Joe called on me and recalled in a recent letter that "you loaded me down with a large number of varieties that I did not have".) Joe and I became close friends and he soon became "hooked" on hybridizing, an avid pollen duster, adept at grafting and proper handling of propagation material. I had already become associated with the Los Angeles State and County Arboretum at Arcadia, close to my ranch at Monrovia and not far from Joe'shome. He began to spend part of his Saturday and Sunday mornings at the Arboretum with me. We set up a project designed to develop hardier cultivars for Southern California conditions, crossing such cross-compatible species as were then available to us. These included the Hawaiian whites, H. arnottianus and H. waimeae and the Hawaiian reds, called H. kokio. Later, H. denisonii, origin unknown, was added to our list. In 1961 I was offered a position as managing director of British subsidiary of the Germain Seed Company, Los Angeles, with headquarters in London. Germain had purchased the Filcoat Process for pelleting seed and had been approached by the British Sugar Corporation to set up a cooperative research deal leading up to an exclusive distribution contract with the Sugar Corporation. My job was to work in close cooperation with the agriculturists of the 17 sugar beet factories in England and Scotland, making field tests, etc. Pelleting seed made it possible to use spacing planters, thus eliminating costly thinning. I was quite surprised to learn that there were 420,000 acres of sugar beets planted annually in the British isles, but after the first season, when it seemed that I had seen every acre, I was sure this figure was correct. Ella and I spent three years in England. However, we always came home for the late fall and winter months. Joe "minded the store" while I was away and reported the progress of our project faithfully. And all was not sugar beets with me - I spent my spare time at the Lindley Library of the Royal Horticultural Society, and in the library of the British Museum of Natural History. I was able to read just about everything in print on ornamental hibiscus, and copy many old color prints of the flowers. In 1963 Joe and I decided that we must have other cross-compatible species for use in our project and thus began the first of our "expeditions". This was, in effect, a return to my job in England by the way of the Pacific Ocean. We left Los Angeles the middle of October, 1963, and arrived in England late in February, 1964. The letters that follow were written during this trip. Letters written on the second and third "expeditions" with a suitable explanatory introduction are also included in this volume. Paralleling Ross' lead as usual, the format of the lead-in letter for each of the three Expeditions, is likewise appropriate for CONCLUSION. At the time of the First Expedition, Ross' and my friendship had become firmly established, still-through all three Expeditions, albeit with twinges of envy because of my remoteness from the exploration action - I was especially privileged to be entrusted with home base operations for the hibiscus aspect of the Gasts' peregrinations. To expand a little, those home front operations -aside from holding down a full-time job at that point in my life -involved frequent 10-mile jaunts from my home in Pasadena easterly to the Arcadia location of the Los Angeles State and County Arboretum Hibiscus Project. There, to check on Project conditions, pollen dusting on crosses we were hoping to achieve (too frequently dusting everything else in bloom), and propagating Expedition materials as received. Operations also involved periodic trips another 10 miles northeasterly to check glasshouses and test planting area conditions at Ross' Bradbury "ranch"; alternately, 15 miles westerly from Pasadena to check Ross' home glasshouse of that period at his Los Feliz Hills residence. As parcels of plant material came through, it was off to the Arboretum Hibiscus Project to set seed, root, graft - as soon after arrival as possible in hopes of offsetting any desiccating effect suffered in the handling and shipping of such material for thousands of air miles. In my "spare" time I upheld my end of the Project-Expedition inter-communications, and it is, of course, Ross' end - his letters to me -that have provided the substance for HIBISCUS AROUND THE WORLD. From my standpoint, the American Hibiscus Society is performing a tremendous service in publishing this volume to provide you readers the thrill of at least vicariously sharing the "triumphs and agonies" of the Gast odysseys. Anyone fortunate (?) enough to have experienced Ross' handwriting (and I thought a montage of it would make a great inside-cover-lining) will appreciate that, despite the anticipation with which his Expedition letters were awaited, it was no small chore to decipher some of his efforts. And, to add to the handwriting problem, Ross has a tendency, for thought to race ahead of script, thereby eliding letters, words or even whole passages - plus another disconcerting tendency, to subconsciously assume that once HE has seen a flower, plant or whatever, that its characteristics must be universally manifest! On the other hand, these circumstances were not wholly unfortunate. In fact, they lent to somewhat of a mixed blessing in that they fostered a sort of empathy, wherein literal meaning became sublimated to an almost quasi-astral presence in Hawaii, Fiji, Tonga, Samoa, Australia, New Zealand, Africa, the Mascarenes - wherever. There was one occasion, however, when any such empathy broke down completely. This was the time when writing from Fiji my cohort casually mentioned - "...the most unusual hibiscus I've ever seen.". .. PERIOD! I had no choice but to contain my exasperation not just immediately but for some 2 weeks more before Ross deigned to define what for identification purposes he had labeled "Fiji #1" (later observed in Australia as Lemon Gem). As mentioned in the introduction, it was necessary to do some clarifying enhancement in organizing the letters for publication, and, perhaps because of some of my '63 character observations, the particulars of this episode got edited out. Thus the flower is rather less flamboyantly described in the En Route Tonga (11/17/63) as " . . . an outstanding variety - creamy white single with heavy raspberry rays extending from the base almost to the tip". Anyway, I successfully propagated "Fiji #1" wood, both as grafts and on own-roots. Oddly, contrary to usual experience, the rooted plants bloomed rather profusely - the grafts never. While Ross' communiques are replete with instances of the frustrations which can come to pass when traveling in foreign climes - the home front was not devoid of bureaucratic inexplicabilities. After Ross finally ran H. cameronii to ground in Brisbane (1/13/64) - and we had successfully grown and observed its unique bloom in the Hibiscus Project greenhouse - one day passing through the main LASCA experimental plant area - Lo and Behold! there were three thriving 1-gallon H. ameronii plants. Apparently the plant introduction office had received seed (probably via Brisbane); someone decided to give it a try, and there they were - without anyone ever bothering to notify the primary interest of the Hibiscus Project. I can't begin to top Ross' tale of the Senhora of Lisbon. (10-21-65) However, there WAS the Saturday after a heavy day's grafting, in a hot glasshouse, clad in old clothes to begin with and considerably more disheveled by late afternoon. At which point I decided to call home, and repaired to a public phone booth at the Arboretum Main Entrance overlooking a part of the Santa Anita Race Track approximately half-a-mile away. After completing my call I stepped out to be accosted by a couple of the local constabulary under suspicion of "post-touting" the horse races in collusion with a bookie operation. Took a "deal" of explaining. The "fuzz" finally accepted my ID. and story - but I'm not sure they really believed me. I could go on, but I'm supposed to be "concluding" AND I think these samples will afford sufficient idea of how even the stay-at-home shares in plant exploration expeditions. Like Ross, I too have a "Madame Secretary." As does Ella Gast, my Winnie, after 39 years, tolerates my hibiscus enthusiasm, but she has performed nobly in transcribing raw letters of the Second and Third Expeditions for printer's comprehension. To fully appreciate the magnitude of this labor, I have to explain that (Ross excepted) I am the world's worst scribbler -so that some of my "helpful" clarifications oft served only to confuse further. After 13 years and more since first reading, and since this time around the original script had to be "transformed" into understandable (NOT just sensed) narrative - we really had fun! But are still together. At the same time though, it did refresh all over again, my recollection of the Gast Hibiscus Expeditions. I trust this volume has afforded to you some part of the experience it was for Ross and me.